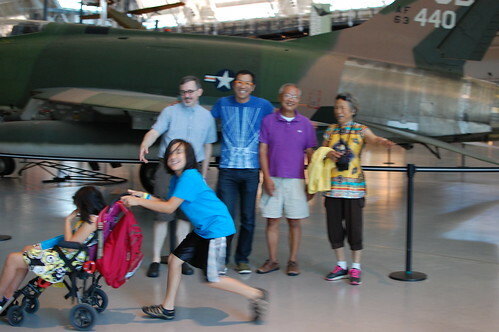 On Sunday of the Lee family reunion, we went to the Air & Space museum near Dulles airport. 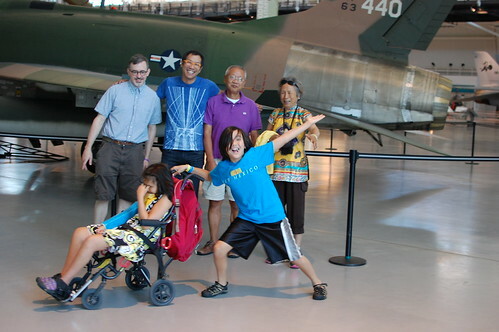 Neither my dad nor my brother have been there - and they like to talk about planes (they are both kind of surprised that Vince really has no interest in airplanes) - so it was great to take them there. It's really my favorite Smithsonian museum - lots of parking, a McDonald's inside, and lots of space to run Edda up and down the corridors without fear of running over meandering toddlers, even on a crowded weekend. 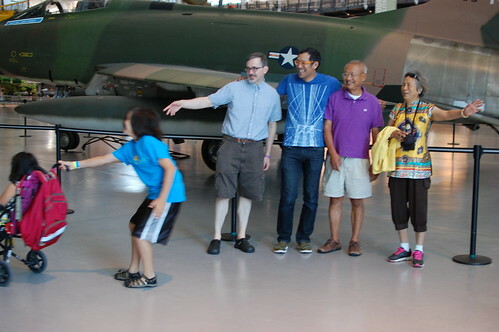 We are standing in front of an airplane (of course, I've forgotten the name already) that my dad used to repair when he was in the Taiwan military for a year when he was young and in the military. 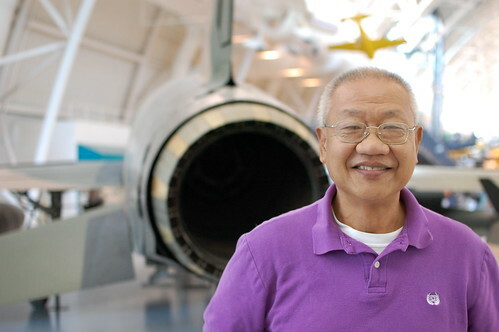 We spent some time looking around the plane and my dad telling us how at least 2 or 3 mechanics were killed when they happened to be sitting in the cockpit seat and the ejection mechanism went off by mistake and they were flung into the ceiling of the hanger. Yipes. Vince was a good sport, he's been to the museum at least 5 times, but he convinced his grandmother to buy him something at the gift shop, so I guess the trip was worth it.. It is a F-100D Super Sabre. We had about 90 of them when I was stationed in an airbase located at central Taiwan. For ours, the air refueling mechanism was taken out by the USA. I don't think that the night fighting capacities were also installed in ours. Anyway, I have spent about one year of my life taking care of these planes. I remembered one day, it was raining heavily and the base received an urgent order to launch these planes with missiles ready. Lot of young mechanics and young ground personnel thought it was impossible to prepare the plane in such a several weather conditions. Slowness or inaction was their response. Guess what, their immediate much older bosses knew the seriousness of an order in the military. They did their best (by force, by personal relationship, by whatever, etc.) to persuade those young folks to do what the order said. Or, at least, carried out the order as its face values, no more and no less. It rained about 45 minutes and eventually, the planes never got launched. Afterward, a military Investigation Team and Court were setup to see how the order was followed and carried out. Fortunately, no one, no one got executed for it because all these old dogs :) around.